Super Pulsed Cold Laser Therapy also called “cold laser” or “low-level laser therapy” (LLLT) is the application of red and near infrared light over injuries to improve soft tissue healing, reduce inflammation and relieve pain. 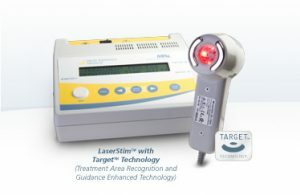 Laser therapy is successfully used all the world in a clinical setting for the last 25 years. It is a highly effective treatment for acute soft tissue injuries, chronic pain syndromes and has shown to be particularly helpful in stubborn, persistent, and “difficult-to-treat” conditions. For many years, Super Pulsed Cold Laser Therapy has been used on sports injuries, arthritic joints, nerve pain syndromes, back and neck pain. 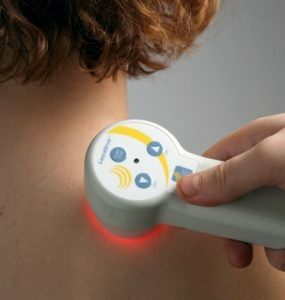 How does Super Pulsed Cold Laser Therapy work? Simply put, Low-Level Laser Therapy (LLLT) causes tissues to heal faster. Specifically, LLLT works at the cellular level. Humans use a natural chemical known as ATP (adenosine triphosphate), to run the body and heal tissue. All of our body’s activities result from the use of ATP, it’s like fuel to a car. LLLT stimulates a microstructure within the cells called the mitochondria to produce slightly higher amounts of ATP (fuel for our cells). Thus, with more ATP at the cellular level, tissues heal faster, and therefore relief comes quicker. LLLT therapy is not harmful. Low-level lasers operate at very low levels of power and unlike high-power lasers have insufficient strength to heat or damage human tissue. It is also completely safe for people of all ages. Contraindications for the use of Cold Laser are having a pacemaker, epilepsy, pregnancy, fever and known active cancer. Research studies suggest the benefits of LLLT are accumulative – it may take several treatments for the results to become evident. The total number of treatments needed depends upon the condition being treated, its severity and each patient’s individual response. How does laser light differ from “natural” light? ‘Natural’ light (including sunlight, common light bulbs, LEDs) emits incoherent light, in almost all directions, over a wide spectrum of wavelengths. Laser light is made up of coherent light waves that are parallel (travel in almost the same direction) so as to produce a small, concentrated beam of light. Laser light is monochromatic, meaning a laser emits light at one or more specific wavelengths rather than a wide range of wavelengths. Different wavelengths of light have different biological effects. Low-level lasers emit wavelengths of light in the visible red to the near-infrared range which penetrate deep into the tissues. There have been no reports of significant or long-term side effects. Since the therapy uses light waves and not heat, there is little concern over harmful side effects. In fact, over 1500 published studies have shown that when used correctly, low-intensity lasers are a safe, non-toxic and non-invasive therapy, free from negative side effects. Super Pulsed Cold Laser Therapy is available with or without chiropractic treatment depending on your condition. Initially, a 45 – 60minute new patient appointment is booked if you are not an existing chiropractic patient. Follow up appointments usually, take 15 minutes. Private Health fund rebates may be available on the initial visit but are not available for ongoing cold laser only treatments. Please call reception on 6281 5494 if you have any questions or would like to book an appointment.